The debate was actually two that took place consecutively, plus a question and answer period. The topic of the first debate was “Is Jesus the Promised Jewish Messiah?” The second topic was “Without the shedding of blood there is no atonement.” This debate was before an entirely Jewish audience. 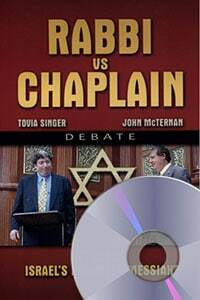 The book is the transcript of a debate between Rabbi Tovia Singer, who represented Judaism while Chaplain John P. McTernan of International Cops For Christ represented Christianity. Rabbi Singer is specially trained as a counter-missionary rabbi to thwart the gospel of Jesus Christ. He is one of the leading counter-missionaries in the world.